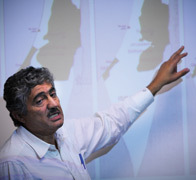 Students for Peace and Justice in Palestine are hosting Dr. Jonathan Kuttab, a leading human rights lawyer in Israel and Palestine, who co-founded the Palestinian Center for the Study of Nonviolence, Al-Haq, and the Mandela Institute for Political Prisoners. He also co-founded the Human Rights Information and Documentation Systems. He is the Chairman of the Board of Bethlehem Bible College and of Holy Land Trust. The lecture will discuss the use of law as an instrument of policy by Israel to continue the occupation, whether the situation in Israel/Palestine defines a state of apartheid, and how international law and the International Criminal Court (ICC) can be used to find a just resolution.